Momix never disappoints. Audiences go knowing that they will be visually satisfied and expecting something new and exciting to excite their tastebuds. 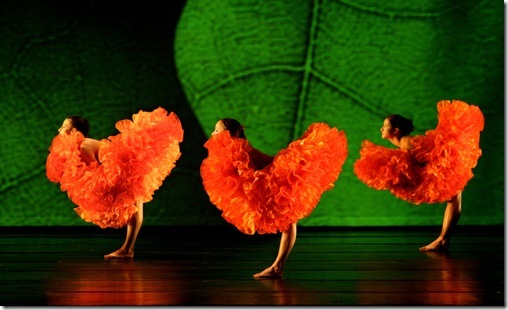 After all, Momix has been doing just that since it was founded 30 years ago. It is similar to returning to one’s favorite gourmet restaurant, being served multiple exotic courses and knowing that one will leave sublimely satisfied. 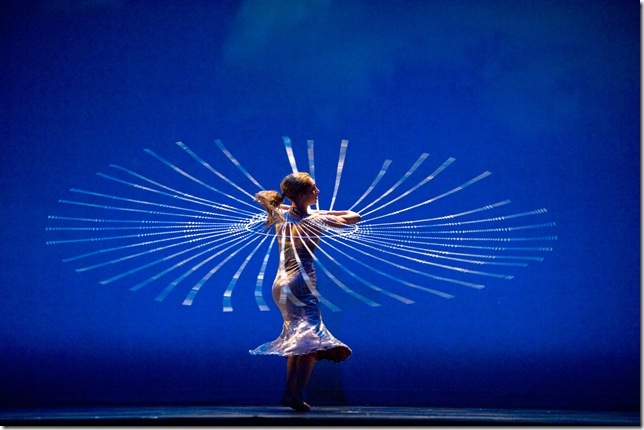 Momix served up a fantastic evening of dance this Friday night at the Duncan Theatre in Lake Worth with its acclaimed program Botanica. It had marvelous dancers, divine costumes, inventive props and just the right touch of lighting and multimedia design. The artistic director and founder of Momix, Moses Pendleton, is a man often described as having an “epic imagination.” One of the original members of the groundbreaking dance troupe Philobolus Dance Theatre, Pendleton has worked also worked extensively in film, television, opera, ballet and other special events such as the Winter Olympics. At present, he has two companies touring six different shows that he has created for Momix. Botanica, which was conceived and directed by Pendleton, is his most ambitious multimedia program to date. In a lengthy and highly collaborative rehearsal process, Pendleton worked closely with his dancers through improvisation to create the concepts and movement. It is interesting to note that Pendleton chooses to refer to his dancers not just as dancers but as “dancer-illusionists.” He also collaborated with Joshua Starbuck, who created the magical lighting design, and Michael Curry, known for his award-winning puppetry in The Lion King, who created the outstanding puppet and prop design. The performance of Botanica took us on a journey through the four seasons of the year, and the beautiful imagery made us feel as if we had been immersed in a time-lapse photography session that had come to life. The titles of the different sections of the evening-length work, as they were written in the program, almost made up a whimsical poem. Fantasy Tree Flower to Tempt Three Graces was astonishingly magical. The seemingly unmanned white drapes that introduced The Dead of Winter rippled until they formed an island with a palm tree-like umbrella and from which three women emerged to be tempted by hanging fruit. Describing it really can’t do it justice. Botanica just needs to be seen and experienced. Some of the images were marvelously pure and strong, but to achieve this purity and strength was technically difficult and complicated. 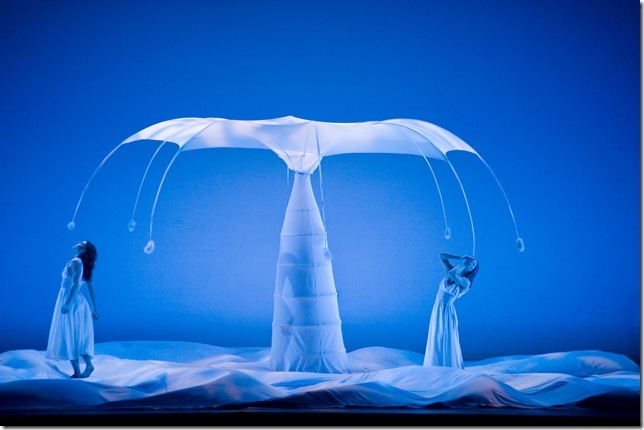 The wonder one feels as one watches the amazing images that continually evolve and dissolve onstage is the wonder of Momix, and what makes the company artistically distinctive. Loons Laugh in the Darkness, with its isolated body parts that created dancing shapes and designs in the dark, was clever and funny. Riding Old Bones to Romance with Ancient Stones was an equally clever title for a haunting little narrative in which Sarah Nachbauer rode in on the back of an enormous puppet. The duet between the two, juxtaposing the life-like movement of the Triceratops skeleton with Nachbauer’s nimble dancer body, was both beautiful and sad as their tender relationship turned to violence. Light and color was restored with the feminine posing of the women in petticoat petals in Marigolds Bloom, and humor was restored in the decidedly male energy of Hornets Hop. The crème de la crème was Elizabeth Loft in The Beaded Web. The one single image of Loft just spinning and spinning as if in a trance with a beaded garb that flared out in different forms as she varied her spinning was totally mesmerizing. 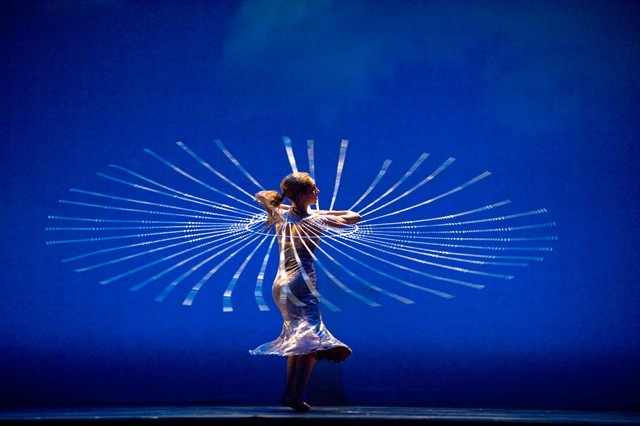 When Botanica was first performed in 2009, it was almost twice as long. Pendleton likes to revisit his works and often changes are made. The Botanica program was trimmed and the intermission was removed. I imagine when this happened, not everything fit. There’s More a Solar Flare Tonight’s Encore was likely part of the original show but too good to throw out. So, after the bows, the dancers returned to do an encore armed with long orange tendrils that looked like the stamen of flowers and, together with the “make you want to dance” rhythms of Brent Lewis, they had no trouble getting the audience to their feet. The evening’s performance left us wanting more of this visual cornucopia, an artistically distinctive presentation with an appeal to all.